Welcome Fr. Jim! | Walk with us! ← Is there a patron saint of copy machines? Fr. 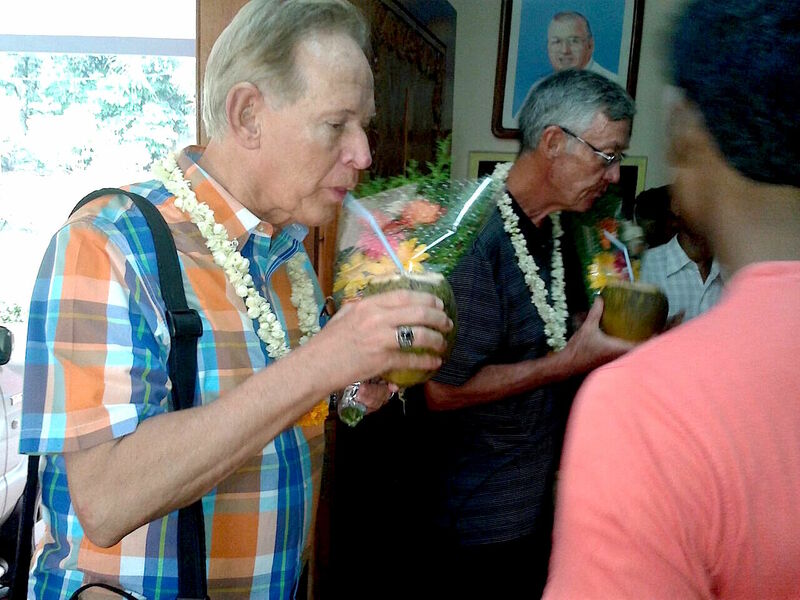 Tom Cassidy writes from India soon after welcoming Fr. Jim to Chennai. Fr Jim will be in India through October to give several presentations and workshops. OCTOBER 5 – Fr. James Schroeder, SCJ, and I arrived via Spice Jet on a flight from Chennai to Kochi. Chennai is the fourth largest city in India after Mumbai, Kolkata and New Delhi followed by Kochi. By our prop jet it’s just about an hour flying time from the east coast of India (on the Bay of Bengali) and south across India to Kochi which rest on the west coast (Arabian Sea). The hour went by fast and before we knew it, it was touchdown and our six-day-visit to Kerala was underway. Br. Sajeevan Marcelin, SCJ (treasurer and formator) was there to greet us along with Anu, one of the philosophy students. Our Dehon Vidya Sadhan philosophy house of studies isn’t too far from the airport, certainly closer than it is to our minor seminary at Kumbalanghi. We enjoyed the Indian ritual that welcomes guests, especially newcomers to a community. At DVS the ritual was complete, leaving out only the use of incense. We were greeted with a song, given a hearty welcome by Fr. Christy Peter Chittapanezhikathuvila, SCJ (superior of the community), handed flowers and then garlanded, and offered coconut milk. The milk I usually only take a sip of as I’m not a fan of coconut milk or for that matter, many other ways coconut is served. Having said that, I should note coconut and coconut milk are often used in Indian cooking and I have no difficulty with its use or flavor. With a handshake and introduction with each of the students the two of us were shown our rooms and invited to the SCJ rec room for the short period remaining before dinner. As our guest, Jim was given the main guest room that was at one time used by Fr. Thomas Fix, SCJ, when he was on staff. I stayed in that room on my first visit to India in 2011. Fr. Fix is revered in India and anyone who had him as a formation director or more important, spiritual director, speak of him in saintly terms. Both Jim and I certainly concur with their assessment. As a travel day we were pretty much given the rest of the day off. It gave Jim a chance to begin to get himself organized as he’s going to be kept busy and has lots of talks to give. He’ll give an hour’s conference to the postulants and philosophy students on Saturday evening. The philosophy students are away at the moment on retreat and will return sometime on Saturday. Because of the length of the trip Br. Sajeevan Marcelin, SCJ, the treasurer and a member of the formation team at DVS, was joined by Br. Xavier Viju, SCJ, who belongs to the Punalore SCJ community living with Fr. Colin Nepolian, SCJ, parish priests at St. Joseph Church, Soorarnaad. Both brothers drive. Keep in mind that not all Indian SCJs drive cars though most, if not all, drive motorbikes. It also helped that Xavier has lived in Punalore for several years, first at John Paul Bhavan, Koodal and now with Fr. Colin. Sajeevan and Xavier are the only two finally-professed brothers in the district. Both can trace their SCJ roots almost to the beginning of our presence in 1994. We had a good discussion about the meaning of the brotherhood and the importance of it as a vocation. In many ways it is very important to a mixed community like ours as it is a constant reminder that we are religious first. Our talks helped to while away the five hours it took us to get to John Paul Bahavan where Fr. Issac Sunil Roma, SCJ, is parish priest and Fr. Siju Solomon, SCJ, is the the assistant. The church is just down the hill from the community house. The four of us were guests for dinner prepared as a joint effort between their cook and the two of SCJs. Many of our SCJs know how to cook, often a skill they first learned at home and perhaps improved during their seminary years. For example, this morning eight of the students were on breakfast detail making chapatti and on Sundays the students always take care of breakfast. Fr. Sunil, while showing us the small parish church, told us that the entire parish is getting ready for their three-day-festival in honor of their patron, St. Jude, whose feast is celebrated on October 28. Fr. Jim asked him if his use of the term parish festival meant this was a fundraising activity of the parish, as would be common in the States. No, replied Fr. Sunil, it is simply an opportunity for the parish to pray and grow together as a community. It will include prayer as well as a parish meal to cap off the celebrations, and I think he said a procession as well. We then headed to our other parish in Sooranad. I was particularly interested in visiting as on my one and only trip to Punalore a couple of years ago we did not have a chance to visit. Br. Xavier lives at Sooranad along with Fr. Colin Neapolitan, SCJ, the parish priest. 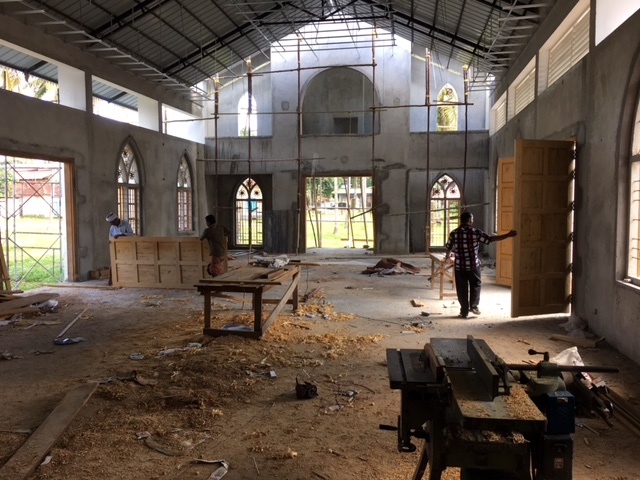 He and his people have been struggling to find the funds needed to complete the new St. Joseph’s parish church. The original built in 1919 is too small for the number of Catholics. The plan is to turn the old church into a parish hall/center. Getting the funds has been a struggle. I think, and this is from memory, they still need about $$78,000.00 to complete it. For now work goes on as funds become available. The new church is a lot larger then the one built in 1919. We did not have all that much time to spend at Kollam. We did manage to get a taste of Br. Xavier’s homemade altar wine that he makes for our various communities. It’s not bad as altar wine goes, certainly as good as what was used in Italy during my time in Rome.